“This is the 14th year of Oregon Ethics in Business in partnership with the Rotary Club of Portland and Rotary clubs across the state. We are pleased to have included scholarship awards to Oregon students over the past 2 years and are continuing to expand our vision of ethics in business,” said Dev Dion, Chairman of the Oregon Ethics in Business Committee. $10,000 in higher education scholarships will be awarded as well to five students, representing each of the five congressional districts in Oregon. The five students will receive $2,000 each provided to Oregon Ethics in Business through a grant from the Portland Charitable Trust. 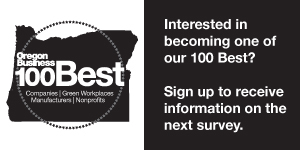 The Oregon Ethics in Business (OEIB) Awards honor those organizations and individuals who have demonstrated ethical business practice in its broadest interpretation: In the workplace, the marketplace, the environment, and the community. The recipients of these awards will have, by act and example, gone beyond the expected to achieve excellence in ethical business practices. The Oregon Ethics in Business Awards began in 2004 and developed as a partnership with the Rotary Club of Portland. Customers, co-workers and suppliers who witness exceptional ethical behavior nominate companies and organizations for the awards.